Understanding how worries are linked to our hearts. Accepting responsibility for our worries. Discerning the connection between anxiety and anxious thoughts. Detecting and destroying the roots of anxiety. Finding deliverance from the temptation to worry. Discovering and understanding the three stages of anxiety. Learning the sevenstage process to overcome typical worries. Creating a testimony by overcoming difficult worries. One could almost guess that I was teaching a seminar on overcoming anxiety! Someone bumped the front of the car, the catalytic converter cover fell off our van, the vacuum got a big crack in it and today our washing machine went! Plenty to worry about if we choose. In a good sense we rejoice for the opportunities to prove that He can care for us in every situation. God is good. God has abundantly supplied for the needs of the seminar just as you have joined us in prayer to Him. Some of our prayer requests were "too good to be true," but they are all being played out by our Majestic Lord in the hearts of His people. What lies ahead? We are trying to figure how to bring the video, audio, slide set together into a series that can be easily copied, translated and utilized. Along with this is the desire to see that a special version would be designed especially for non-Christians. We understand that many of you are extra busy during this season, but we really hope that you can continue to keep up your supportive prayers for us. As much as you join with us in prayer, so you bear fruit through this ministry. Grace astounds us with its powerful story of God's love. Grace shines through all the pages of scripture amazing us with an awesome but puzzling picture of God. Grace is a truth which is like a boat on the sea never being able to fathom the glories below. The more we understand grace, the more we stand humbled in its shadows convinced we will never well understand it. Praise God for great attentiveness and attendance during the seminar sessions. Thank the Lord that He provided a better projector . 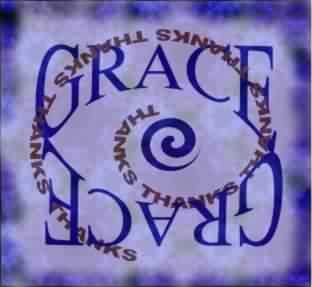 Praise the Lord that the "Grace and Graciousness" series was completed on time (end of November). Thanks for the faithful brothers helping tape and set up for the seminar. Praise God that our average number of web pages read daily reached 100! Thanks that our family's health is fine now. Thank the Lord with us that our vehicles and washing machine have difficulties! (He does say "in everything give thanks). Thank the Lord for Elizabeth's temp job. She has to speak Chinese all day long! One person shared that she connected her negative life perspective with worry through the seminar. Because of responding with worry, she could never see the positive side of how God could possibly work. She is now very open to changing to a life of trust! Praise the Lord Rebekah is big and well. Linda is fine too and gaining more energy. Pray for God's perfect peace to touch each heart. Many are from East Asia. May God's Spirit work mightily . Continue to pray for more openings to teach this seminar. Pray that the equipment would continue to be of use and protected from harm. Pray for protection and peace as Paul develops and teaches this seminar. Pray for Paul as he speaks Dec. 7th to a large student fellowship. Join in praying for 150 pages to be read on the web site daily. And even more importantly, that God's Spirit would significantly touch those lives. Pray that God would raise up a godly generation for His glory. Ask that God would open up the opportunity to put this whole seminar on the web. We also would like to translate it into Chinese and develop a mini-course for reaching non-Christians.